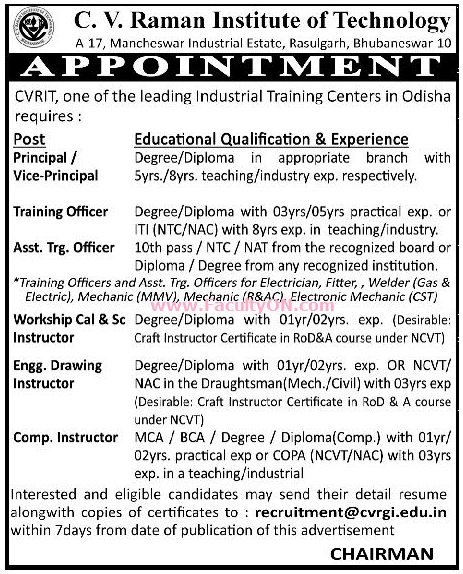 C.V.Raman Institute of Technology, Bhubaneswar has advertised in the SAMAJA newspaper for the recruitment of Teaching Faculty- Principal / Vice Principal Plus Non-Faculty jobs vacancies. Interested and eligible job aspirants are requested to apply within 07 days from 30th July 2018. Check out further more details below. About College: C. V. Raman College of Engineering is a progressive institution in Orissa, set up to promote the highest standards of technical education in the state. The institution aims at molding a new breed of technocrats with a competitive edge to match both national and international standards. The college aims at educating the students to become not only competent professionals but also excellent human beings who would contribute towards the welfare of the society and help in raising the quality of life of its people. Computer Instructor- MCA / BCA / Degree / Diploma (Computer) with 1-2 years practical experience or COPA (NCVT / NAC) with 3 years of experience in teaching / industrial.